The Brick House...in pursuit of stronger lives. 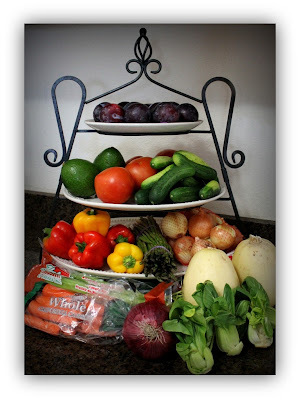 : What Can You Get at the Farmers Market for Under $20? What Can You Get at the Farmers Market for Under $20? I am a huge Farmer's Market fanatic. It started long ago, when as a teenager, my sister Kristi and I both worked at the Virginia Beach Farmers Market. The summers were filled with trailers of Silver Queen corn, watermelons, snow cones and cotton candy and the fall was pumpkin patches and hay bales. Combine that with my mother's love of any vegetable, and now as an adult, it is hard to go a week without a trip to the market. This morning my sweet neighbor, Val, went with me to get a basket of goodies. Each of us went with just $20 and we came back with bags of food & money left over! Check out what I got for just $17! You cannot beat the deals! There is no other way to provide healthy foods for your family at a reasonable cost. There are a few things that you may want to keep in mind when going to the market for the first time. Don't buy the first thing you see. Take your time and check prices because competing vendors may have better prices or better quality. If you have never been to the market, take a walk around first, making note of prices as you go. Bring a cart, wagon, stroller, etc. because you are sure to fill it up! Don't forget your reuseable bags too! Once you are a regular at the market, the vendors get to know you and often times are willing to give you a bit of a deal now and then. A trip to your local market may be out of your normal routine, but check with your county agriculture center to find one near you. Going to the market reminds me of the woman in Proverbs 31:14 "She is like the merchant ships, bringing her food from afar." Taking care of my family is the highest calling! So many good reasons to shop at your local farmers market: Save $$$, Buy Local, Fresh Food recently harvested.